Everyone loves a multi-tasker don't they? Whether it's a blush that doubles up for the lips, or that eyeshadow that works as an eyeliner and a brow product as well, there's something pretty satisfying about having a multi-tasker that makes you feel justified in handing over the cash for it. On a recent trip to my local Whole Foods, I saw a new brand had popped up in their beauty section. The new brand is called Mount Purious, and they describe their products as 'raw'. I know, sounds a bit weird and a tad pretentious. The basic concept is that they have pure oils in all their products and these are untouched by any synthetic chemicals and additives. The pure unadulterated oil takes centre stage here, which I find oddly comforting. I'm all for chemicals at times, especially for my acne, but sometimes, I feel like going au natural. They have a nice range of products, and I was really stuck deciding which one to take home with me to try. I decided on the Camellia oil, as I've heard that this is great for the hair, is chock full of omega-9 oil, has anti-oxidant powers, and really good at penetrating deep into the skin. Since Camellia oil had been on my to-try list for so long, it seemed silly to pass up the opportunity. The packaging for this oil makes it really easy to dispense, it's a nice flat pump that doesn't have too wide an opening so you won't face the problem of pumping out too much in one go. This oil has no scent, so it's quite good putting this on before applying perfume. I found perfume 'stuck' to me for a little longer after putting this oil on my skin. If you have dry patches on your skin, then an oil like this one works really well with getting the moisture back in. I have recently found my legs drier than usual (I have eczema, so always am mindful of dry skin), and slapping some of this oil (alternating with another moisturiser every other day) on has restored them almost completely, and I've only used this a handful of times since buying this a few weeks ago. It also works at taking off make-up which is why I've brought it on holiday with me, it's saved me having to decant and bring lots of things. If I do have one criticism, it is that the oil is fairly stiff? Think of whipping eggs for meringues, where you're aiming for the egg whites to be solid enough to not fall out of the bowl? Yes, this oil is a bit like that. It comes out runny, but within a couple of seconds of rubbing this into the hair or skin, it becomes really hard to move around, and you end up dispensing more. For me, this means I've ended up putting far too much oil in my hair because I felt that I wasn't able to work it through all my hair, and ended up with an oily mess of a mane, and having to wash it out and start all over again. Not fun. It's possible that this might just be me, being overzealous with my hair oiling, or it needs a slightly lighter oil blended with it in order to make it easier to work with. I personally will carry on using it more as a skin moisturiser, and I really want to try out their Argan Oil and Rosehip Oil. 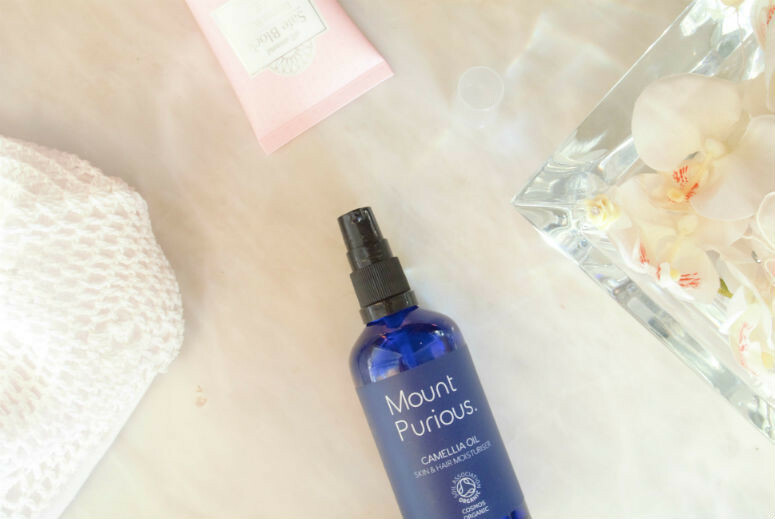 If you're looking for an organic hair and skincare option, that can moisturise and take makeup off at once, then the Mount Purious Camellia oil is something to look at, if not, then the other oils they have in their range might be more suited to you. At £12.95 for 100ml, it's a fairly good price, so it's not a massive investment or waste if you do't like it. Have you encountered this brand yet? If you have, is there anything you're interested in giving a go?